Tall Emus Stock Management system extends the basic features found in your accounting system to offer the business capabilities you need, without the costs of changing to enterprise-level accounts and ERP systems. Surface all this information during the quoting and selling process. Sync stock data to your accounting system so your GL is up to date. Purchases can be ‘received’ into stock-on-hand count and sold, then ‘finished’ on receipt of ‘actual’ vendor invoice. Tall Emu will calculate an estimate Cost of Goods sold on receipt of stock for profit reporting, and automatically journal the adjusted profit calculation when the purchase cost is finalised. The Bill of Materials is a list of the inputs or the recipe that makes up a manufactured product. The ingredients or parts that are a part of the BOM’s can include depleting, non-depleting, ‘special’ stock and even labour. Any raw material as “Stock On Hand” asset accounts can be place it into the Manufactured Stock as it’s used. You may also have to reverse the assembled BOM and ‘disassemble’ and Tall Emu will return stock used back to (raw material) stock-on-hand count, where the items are recoverable. Manufactured items and bundles provide methods to ‘bundle’ combinations of stock tracked/non-tracked Stock to sell as one product. 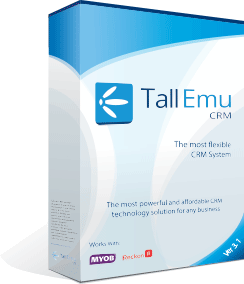 Tall Emu CRM can automatically calculate Kit selling prices. Sometimes you need to sell the same base product under different codes or names (for example – a tire that fits on 3 different cars). This can be used to make it easier for staff to quote items that are suitable for a product with limited training, or to charge higher prices for the same item where it works with a premium product. Virtual products draw their stock levels from the underlying “real” products so you always have accurate stock holding information. Create multiple “price levels’ depending on who you are selling to. Example: Wholesale, Retail, Trade, Not for Profit, Direct). You can define custom price breaks depending on volumes sold and this can be unlimited. These pricing contracts can have automatic start and end dates, or they can have be no ended.